Out of the way but always where you need it! 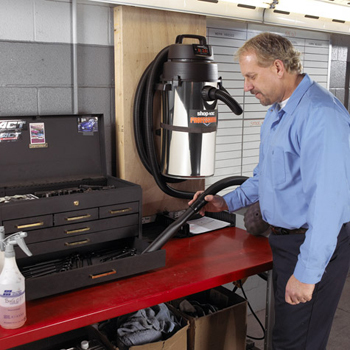 The Shop-Vac Stainless Steel 8 Gallon Wall Mounted Garage Vacuum provides excellent suction to clean up vehicles, work spaces, and garages. The vacuum hangs anywhere on a wall but has an extra long hose to access a wider area. The two stage motor provides more power and a longer life. The Shop-Vac Stainless Steel 8 Gallon Wall Mounted Garage Vacuum is similar to a central vacuum system. It never needs to leave the wall. Just insert the 25 ft. Lock-On hose and you can reach throughout most average sized garages. The two-stage motor has two working impellers that improve suction versus a single stage motor. The Shop-Vac Stainless Steel 8 Gallon Wall Mounted Garage Vacuum has 80 inches of sealed pressure. Sealed pressure is the measure of how far a vacuum motor can lift a column of water up a glass tube. It's also called water lift. At 80 inches, this vacuum has more than enough power to clean auto carpet and upholstery, garage floors, and work surfaces. This vacuum runs surprisingly quiet thanks to the two-stage motor. It can be used in a work space with multiple people or even in a home without being too disruptive. The Shop-Vac Stainless Steel 8 Gallon Wall Mounted Garage Vacuum also has a longer brush life than a single-stage vacuum. When it comes to power, performance, and space-saving design, the Shop-Vac Stainless Steel 8 Gallon Wall Mounted Garage Vacuum is the perfect choice!